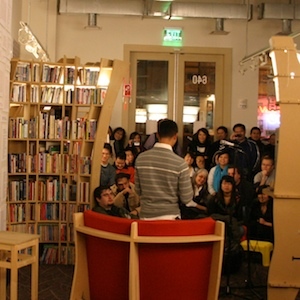 Monday evening, the Storefront Library hosted a rousing spoken word performance sponsored by students of a Storytelling, Performance and Production class at the University of Massachusetts, Boston in collaboration with the Asian American Studies Program at U. Mass. Open to the public until 9PM, the Library was packed and standing room only—which is good thing for poets and also our expectations about what a library, a storefront, and a city can offer. this event was an inspirational and positive for the community. it was exciting to hear the stories and poems people from the community had to share. Lets hope there is a permanent library so that there can be a safe haven of learning and sharing of our experiences.